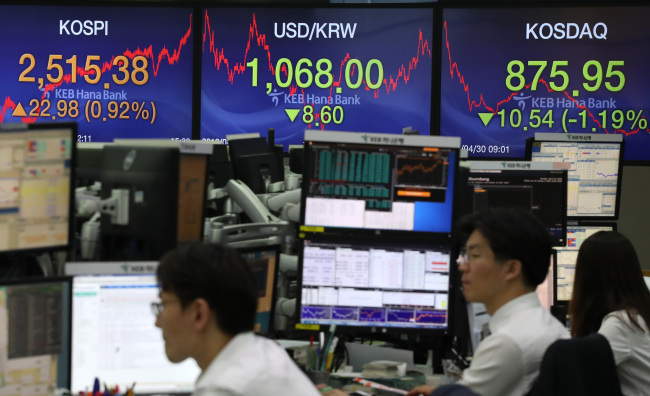 Foreigners turned net sellers of South Korean stocks in April from a month earlier, with their stock holdings on the local exchanges reaching 32 percent of all listed shares, the financial regulator said Saturday. Last month, foreign investors sold a net 2.204 trillion won ($2.1 billion) worth of local stocks, a reversal from net purchases of 123 billion won worth of stocks a month earlier, data from the Financial Supervisory Service showed. 1.2 trillion won stocks sold, net. But US investors bought 1.4 trillion won stocks, the FSS data said.